What a terrible waste. One of the few moderate Arab nations has been rocked by a revolution. Beady-eyed hairy-faced Islamo-fascists poised to take over, determined to drive Israel seaward and smother what remains of the Middle East under one giant burqa. This is the Egyptian scenario painted by influential and allegedly conservative pundits. They insist Hosni Mubarak was a moderate, and that the millions gathered at Tahrir Square and elsewhere across Egypt were agents of, or being manipulated by, the Muslim Brotherhood (MB). Yes, Mubarak preserved Egypt's peace with Israel and toed the American line in his foreign policy. But there is nothing moderate about a leader amassing a multibillion-dollar personal fortune while half his country lives on US$2 ($2.60) a day or less. Millions of Egyptians live in overcrowded hovels and hundreds of neighbourhoods characterise hopelessness, unemployment and disease. One quarter of Egyptian adults of working age are out of a job. Egypt has no middle class worth noticing. The United States provides US$1.3 billion in military aid and about US$800 million annually in economic assistance since 1979. Economist and Egypt's former minister for development and planning, Ismail Sabry Abdallah, negotiated the first package with USAid in 1974. ... distributed by the Egyptian government in an anarchic way, through personal contacts and political influence. There is also nothing moderate about a government instituting a system of torture against political dissidents. Former Egyptian Vice-President Omar Suleiman, who announced Mubarak's resignation on Egyptian state television, was also Egypt's feared security chief. 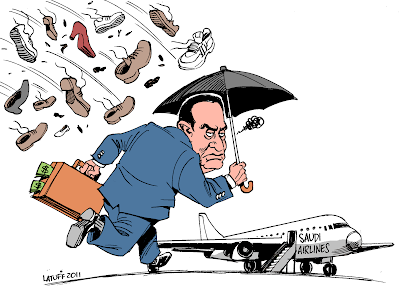 Suleiman managed the regime's role in its joint extraordinary rendition programme with the US, in which terror suspects were kidnapped and brought to Egypt. Among them was Australian citizen Mamdouh Habib, who spent six months in Suleiman's torture chambers. Habib alleges Suleiman himself managed Habib's torture, which included being subjected to electric shocks, beaten and drugged. Habib was then transported to Guantanamo Bay where he was held until 2005 before being released without charge. Mubarak maintained his grip on power for three decades with the full support of the allegedly civilised and democratic world. His mantra was that without him Egypt would be overrun by al-Qaeda's allies in the form of the MB. Mubarak used post-9/11 paranoia about Islamist terror to manufacture a mythology about the MB in order to maintain his corrupt regime. Yet the relationship between the Muslim Brotherhood on the one hand, and Mubarak's regime and its Western sponsors on the other is quite complex. The MB has been a fixture in Egyptian politics and society since it was founded by school teacher Hasan al-Banna in 1928. Conservative commentators never tire of claiming that Islamist groups such as the MB are allied with Western leftists. Ironically in Egypt, the political wing of the MB is considered socially conservative and laissez faire capitalist. Historically, the MB has always been anti-communist and anti-socialist. In his 2004 biography, Nasser: The Last Arab, Palestinian journalist Said Aburish writes about Egyptian strongman Gamal Abdel Nasser's problems with the MB during his rule from 1956 until his death in 1970. Despite being a devout Muslim, Nasser believed in the strict separation of religion from politics. His crypto-socialist economic and land-reform policies were rejected by the MB, one of whose number tried to assassinate him. Nasser then mercilessly repressed the MB, whose leaders and cadres were detained and tortured in what Aburish describes as concentration camps. Britain and the US, which were largely opposed to Nasser, supported the MB. For almost two decades, two distinctive age groups within the MB have been waging an internal ideological struggle. The first group - the 'old guard' - was formed during the harsh experience of the MB's repression under the former Egyptian ruler Gamal 'Abd al-Nasser ... By contrast, the second or middle generation is made up largely of the student leaders of the 1970s, when Anwar al-Sadat allowed the MB to take over the university campuses ... [showing] interest in building alliances with other political organisations. Furthermore, the MB has deep links with Egyptian society through an impressive network of social service institutions - schools, hospitals and orphanages. They claim to control one-fifth of Egypt's active non-government organisations. One of its organisations, known as Gami'a Shar'ia, manages 4000 mosques and has two million members. The Mubarak regime, while officially banning the MB, allowed the organisation to manage these services. The MB's social network has been described by some observers as a state within the Egyptian state. With such a strong grassroots base, it's little wonder that in the 2005 elections MB candidates won more than 60 per cent of the seats they contested. Now they are represented on a 10-man constitutional amendment committee, though their representative, Mohamed Morsi, told al-Masri al-Youm magazine recently that they had no intention of running a presidential candidate. By now, some readers will be shaking in their shoes at the prospect of an Iran on the Nile. They should calm down. No protesters were seen at Tahrir Square in Cairo holding posters of Khomeini, let alone bin Laden or Zawahiri. Irfan Yusuf is a Sydney lawyer and author of Once Were Radicals: My Years As A Teenage Islamo-fascist. This article was first published in the New Zealand Herald on Tuesday 22 February 2010.